NB If you’d like to enter this year’s contest, you’ll need to act fast, because the deadline is this Wednesday! (11th March) Full details of how to take part are below. Remember, this is one competition in which there’s a great consolation prize for every entrant: just be entering, you’ll have helped someone worse off than yourself. Thank you so much! Debbie Young: There are so many unethical writing competitions about that it’s refreshing to find one that’s not only ethical but selfless, raising money for a very good cause. How long has the competition been going, and how much has it raised to date for the charity? Margaret Graham: This is the start of WforW’s third year. We are still a small charity, but growing every year. We have raised in excess of £10,000 so we’re bang on target. It is run by we three grannies, Penny Deacon, Jan Speedie and me. We’re all writers and feel that any money we raise to help the recovery of the wounded has to be earned. In other words, we don’t just sit back and wait for donations, hence the writing competitions. My son and son-in-law have done an Ironman and a Triathlon for us. The grandchildren make loom bands bracelets to raise money. One of them did it at school with two friends. Twice the money was stolen, but they persevered. In the end they raised £5.27 and it is a very precious £5.27, let me tell you. Josie wrote a note saying that they’d done it because …’you are an inspiration to me and my friends.’ The best accolade any grannies could have I think. We were utterly thrilled. Margaret Graham: The first two years concentrated on flash fiction, poetry and memoir, which is working well. We don’t have a different team to filter, we do it all ourselves, as experienced writers. I’m interested in the self-publishing revolution, and though I’m traditionally published with Random House, I wrote a contemporary, for which they didn’t have room, so I brought it out myself as an ebook. I found it an interesting experience, and realised that I was lucky to have some sort of a name to help the book poke above the parapet. This led to the grannies feeling that it would be a great idea to launch The Independent Author Book Award this year to try to achieve the same for others. We always have a commended, highly commended and top three, and to be placed is a great way to attract attention. Palamedes PR offered us a professional press release for the winner and the opportunity of a discounted press release for the 2nd and 3rd. Frost Magazine will review the top three. Debbie Young: Can you please explain briefly how to enter? Margaret Graham: The shorter prize can be entered via the website www.wordsforthewounded.co.uk as a text submission, or as an email attachment, or by post. You can print the entry form from the website and send it with postal entries. It is all explained on the website if you go to the How to enter tab. Closing date is 11 March 2015. Winners are announced on 6th June. The shorter length is published on the website but copyright remains with the writers. Debbie Young: It looks as if the entry field is very broad, which is also very refreshing. Who are the winners from previous years? Margaret Graham: We’ve had winners of all ages, and I think the benefit has been a huge increase in self-confidence, but I remember that happening to me in the early days. As an aspiring author, I was one of the best entries in a novel manuscript competition. The fact that later I found I was 22 out of 22 didn’t matter! I had a taste of success, and it carried me forward. Debbie Young: What percentage of the entry fee is spent on administering the competition and providing the prizes, and what proportion goes to fund the good work of the charity? Margaret Graham: Every penny raised goes to the wounded. Last year we had sponsorship for the prize money from Freddie Hodgson, independent author of Putney Ferret, and this year I will pay it. The grannies absorb all the other admin costs like printing. It was a pact we made. Two of us have fathers that were in the services, my mother was an army nurse, and my grandfather, Percy, survived the First World War but took his own life a few years later. Then just a few years ago I met a lovely young man being pushed by his wife with his portable ventilator on his chest, both under 25. He is tetraplegic after being shot through the neck in Afghanistan. War is relentless and the price paid is high. It was then I decided it was time I did something to help. Penny and Jan agreed. We think of Percy and know that Words for the Wounded has a job to do and that we must raise as much as we possibly can. Debbie Young: I am sure that writing is very good therapy for dealing with the stresses of serving in the forces. Do you have many entrants from the military taking part? Margaret Graham: We have a few entries from those still in the services, but far more from ex-service personnel, especially in the memoir section. I am hoping that we attract more as we grow. With charities one has to be patient, and grow slowly, in a way that can be managed ethically. Or that’s what we think anyway. Debbie Young: Do you have any supportive quotes from previous winners that you might share? Margaret Graham: From Kaori Crawford, last year’s winner, with Leopold. Kaori had just given birth to a baby, so it was a double whammy. It was a great thrill to receive the notification, and I was very pleased to read your kind words on ‘Leopold’. 400 words is a challenging remit, and I wasn’t sure that I’d managed to hold the story together. I’ll look forward to reading the other entries. Debbie Young: Clearly 2014 was a very special year, marking the centenary of the outbreak of the First World War. What did the charity do to mark the occasion? 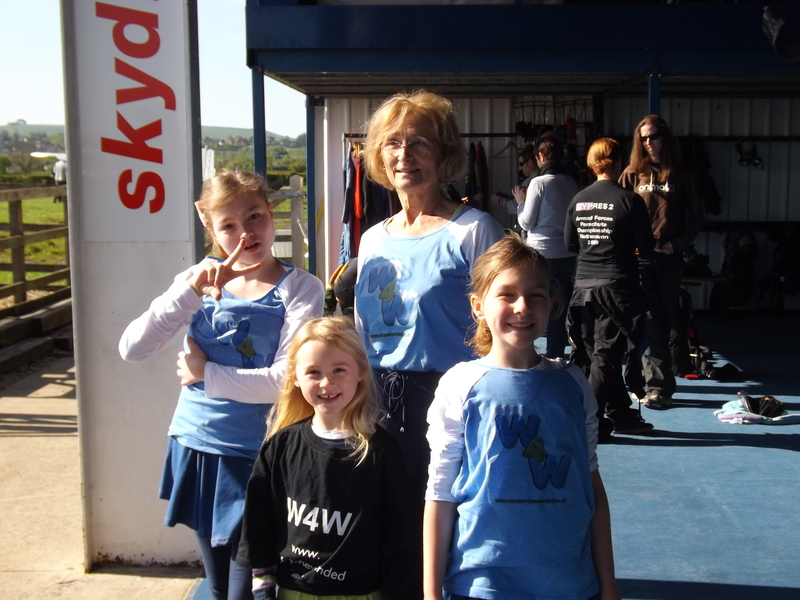 Margaret leads the cheerleading team at the Words for the Wounded skydive! Margaret Graham: Words for the Wounded grannies have bucket lists! We decided that, when possible, this list must be used to raised funds. So in the summer we did a tandem skydive. This was not just for the thrill of being strapped to a fit young man (honestly), but to gain sponsorship. I was totally mortified because at the last minute I had an old injury raise its head, so my youngest daughter, Annie, was a temporary grannie for the day and took my place. I led the grands in cheerleading. Well, hardly led. Sort of waggled my pom poms and lagged behind the ‘grands’ steps. We raised over £2,000. As always, we paid for ourselves so everything raised went into the pot. In 2015, the anniversary of the end of the 2nd World War we are having a LitFest Day in Downley, with Katie Fforde, two Midsomer Murders writers (one of whom I taught), Penny Deacon, talking about crime writing, an agent, and a self-publishing panel, which I hope you will join, Debbie. More details are here. Debbie Young: Thank you, I’d be glad to take part, and I’m looking forward to it already! You say that you are particularly supportive of the indie publishing sector. Any predictions for 2015, with regard to the nature of publishing and the book trade, with specific reference to the continuing rise of self-publishing? Margaret Graham: I am supportive of all good writing. I do emphasize good. It is important that the work is edited, re-written, edited, and re-written again, so that an author publishes a book that is as good as it can be. Having said that, I haven’t a clue what is going to happen in the publishing world. I do like the co-operative independent author groups that are springing up with the various skills being shared amongst the group. It also helps slice through the isolation that writing can bring. To have an organisation like the Alliance of Independent Authors is surely a huge comfort, and reassurance. Onwards and upwards, I’m sure! 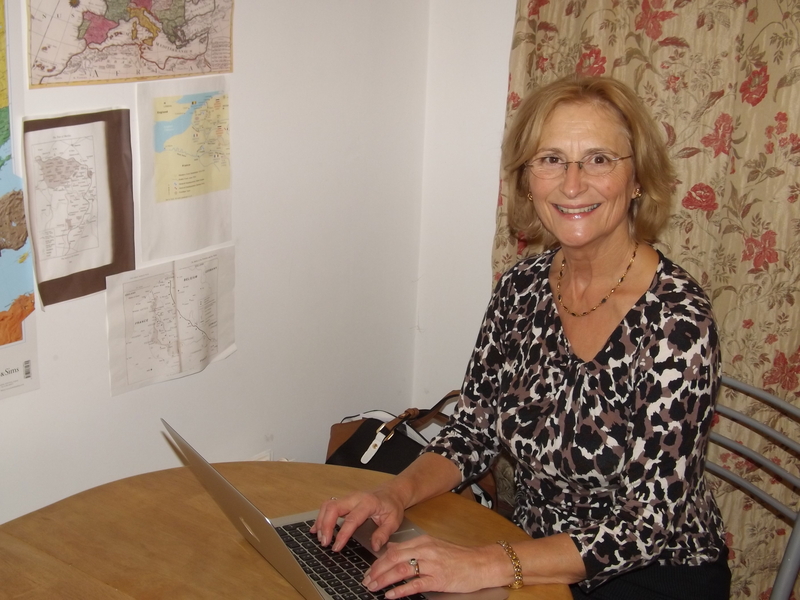 If you’d like to join us for the fundraising Words for the Wounded LitFest that Margaret Graham is organising in High Wycombe on Sunday 18th April, you’ll find more details on the Words for the Wounded website homepage.